This seasons hot shoes must be chunky heels! I am so exited that this shoes made their comeback to fashion scene because they make every outfit edgy and elegant at the same time,plus they are super comfy! This type of heels made their debut at the 1960’s and then again at he 90’s. Well gues what they are back in full force. Brands like Givenchy and Balmain are taking chunky heels to new hights with their amazing designs. I guarantee you will look in trend and stylish with these heels on.You can combine it with plain shirt,boyfriend jeans and coat,or you can go with elegant suit and make it look edgy. In a past few years braid has become very versatile,you can wear it for red carpet or just for shopping with your girlfriends. There is so much ways to wear this trend,but i’m just gonna explain two of them. 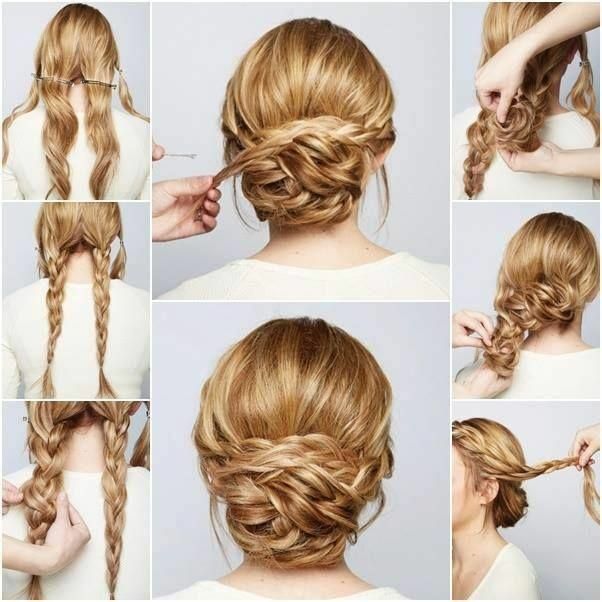 Prom,wedding even red carpet,braid can be the perfect hairstyle. You can wear it up,down,sideway what ever you want. It’s very versatile and can polish up your look. In the picture below you can try out look that i choosed for a wedding. Messy side braid is perfect for casual look. It’s easy to make and you achieve effortless trendy look. It goes amazing with plain t-shirt , boyfriend jeans and some cool heels. Rubber boots ruled the Glastonbury as a street style. Because of the weather everyone got a little dirty,but I love it. Glastonbury had some amazing street style looks and I choose some od the best. How old is she? Stunning Sandra Bullock rocked the Minions red carpet premiere at the Shrine Auditorium. She looked amazing in a black dress with a pop of yellow shoes,and super chic sunglasses. Yesterday,singer Taylor Swift had the most star-studded performance ever! Kendall Jenner,Gigi Hadid,Karlie Kloss,Martha Hunt,Cara Delevingne and Serena Williams walked the stage like they are walking the runway,while they famous friend performed the song ”Style”. Like the song lyrics goes they will never go out of style. At least that’s what we think now. See the pics below! At the music festivals it’s all about free spirit and that bohemian style. This summer it all started with now iconic Coachella Music Festival. Lot’s off hot shorts,edgy boots and fringe. Well don’t pack up that style quite yet because we have Glastonbury Music Festival ahead. At Glastonbury we expect to see outfits such as outfits at Coachella. Aztec print,lots of fringe,bohemian dresses and hats. Below you can se small gallery of perfect style for this kind of music festivals. Kendall Jenner stunned in an all black outfit while out in Paris. Her hair was up in a messy bun. Flawless! Summer is officially here. Everything is better,lighter,life is easier. When I think of summer,I think of the sea,waves and white sand. Summer is time when everyone relax,even in the fashion. This is the season where a maxi dress is a must have. White is the new black in the summer. Hats become just important as the shoes. That’s why I love summer. Hope everyone will have the best summer,and remember,white,hat,dress = best summer style. Perfect and classic summer style.